Even wondered what to do with leftover soup other than serving it as soup again? Well, I did too, and put my thinking cap on. Having eaten all the meatballs out of yesterday's soup, all that was left over was noodles and vegetables. Thinking back to my mum's baked spaghetti some 40 years ago, I had an idea. Draining the water off, I was left with a nice filling for a frittata. I also raided the fridge for other orphaned bits and pieces, finding the crushed soya beans and some Parmesan and mozzarella cheeses. I fried up a couple of sliced onions in a little Fry Light and while that was cooking, mixed four eggs with the grated cheeses and crushed soya beans. Once the onion was soft, I chucked the noodle mix in the pan and stirred to heat it up, then shook the pan to level it all out. I carefully poured the egg-bean-cheese mixture evenly over the noodles and spread it right out to the edges. Turning down the heat a little, I covered the pan with a lid while I grilled some tomatoes and placed a handful of salad on a couple of plates. 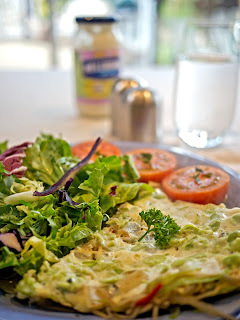 As soon as the frittata had firmed up, I served it with the salad and tomatoes, and some Extra Light Mayonnaise on the side (½ syn per tablespoon). It worked surprisingly well, even Husband was impressed; and it gives me great pleasure to have created a new dish out of leftovers.